I recently had the good fortune of participating in a New York Times piece (published in the Home section today) on green home consultants. After a few hours of in-home work and many more of analysis, reporting, product research and follow-up with my clients, it was somewhat ironic that the lead image for the story was a picture of me peering into the tank of a toilet! One could argue a toilet is a fitting representation of our times, after all. The economy remains in the tank, we continue to do relatively little as a society to combat climate change, and the residential green sector continues to dragged down by the horrible housing market (unless you happen to be in one of the few sectors directly benefiting from stimulus funding). However, we still see a very bright future for the overall green remodeling/retrofit market. The lowest hanging fruit on the path to a lower-carbon economy lie in our homes, from weatherization to low-flow water fixtures to efficient appliances and lighting. The environmental savings can be significant, and many projects will start contributing to your bank account in less than a year. Although each of our individual actions might be a drop in the bucket (as noted by some of the skeptical folks interviewed in the Times article), our collective actions will amount to significant change and send a message to both companies and our elected officials that the old way won’t work anymore. Make the easy fixes that have high environmental and economic benefits first. Many first steps can be done for $0 – $100, and can cut major chunks out of your energy, water and carbon footprints. Good examples include turning down the temperature on your water heater, replacing inefficient lighting, installing low-flow water fixtures, sealing leaks and drafts and installing a programmable thermostat. Swap out key house systems, starting with the biggest hogs and/or systems that have multiple impacts. Once you’ve cut your baseline down based on #1, turn to these bigger projects. Great places to start are the water heater and furnace, since they influence the energy use of everything downstream, and the clothes washer, since it consumes both water and energy and produces greenhouse gases and wastewater. Install sustainable systems where possible for remaining water/energy needs. By now, you’ve probably cut your energy, water and sewer bills by 30-50%. But there’s a huge added benefit to this tiering of projects: you’ve also reduced the cost of major sustainble system upgrades. These projects, like solar panels, solar hot water heaters, wind turbines, graywater systems and rainwater capture/reuse systems, will be as much as 50% less expensive if they follow the projects in Tiers 1 and 2! Offset the rest. In most existing homes, it’s nearly impossible to competely cut your outside energy use and associated carbon footprint. Buy offsets for this remaining piece. We believe it’s always best to cut your own carbon footprint first rather than paying someone else to do it via offsets, but they’re a great solution for those stubborn emissions that elude even the most eco-committed of us. Of course, a consultant isn’t necessary for any of this. Many websites offer great resources to help you sort through the options. And many online tools like ourEnvironmental Impact Calculator can help you estimate the savings of green home projects, both environmental and economic, so that you can create a prioritized list based on your home’s unique characteristics. Oh, back to the toilets. 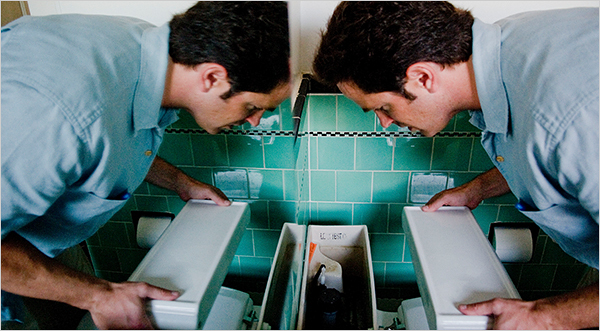 Toilet leaks can be huge water guzzlers, and I see leaks in as many as 10% of the homes that I visit. In this case, though, they were in perfect working order!